Some fantastic artists are being featured at RAW Chicago – REVOLUTION show!! Come out get all fancy in your cocktail attire, show your support for the arts, and have a blast at the Condord Music Hall for the art, music, live performance event. Tickets are $15 for the art event can be purchased on Alicia Londos’s artist webpage for the big event. WHAT CAN I EXPECT? – RAW events are multi-faceted artistic showcases. Art event features a film screening, musical performance, fashion show, art gallery, performance art and a featured hairstylist and makeup artist. These artists are all local, hand-picked talent who have been chosen to feature at RAW. WHAT IS RAW? – RAW:natural born artists is an international independent arts organization that hand-selects and spotlights independent creatives in visual art, film, fashion, music, hair & makeup artistry, photography, models and performing art. RAW’s mission is to provide up-and-coming artists with the tools, resources and exposure to inspire and cultivate creativity. RAW educates, connects and exposes emerging artists in over 60 artistic communities across the United States, Australia, Canada and the U.K. 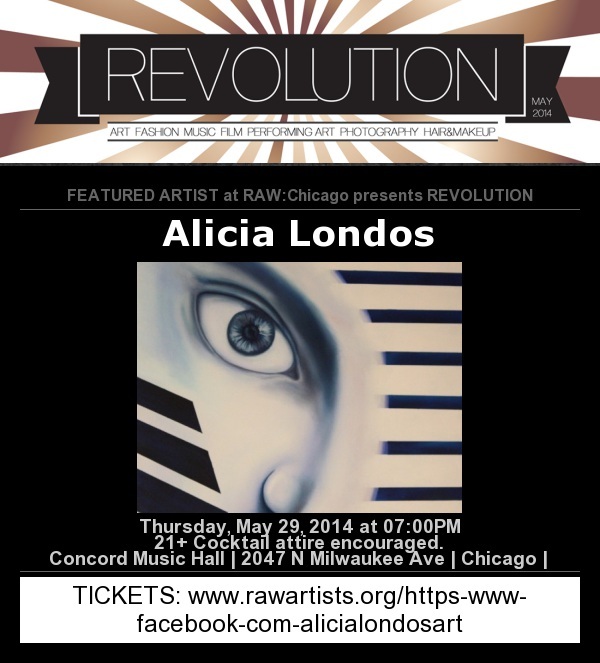 This entry was posted in Openings and Events and tagged Alicia Londos, RAW Natural Born Artists. Bookmark the permalink.